SACRO OCCIPITAL RESEARCH SOCIETY INTERNATIONAL Inc.
Chancellor MILLENNIUM HOLISTIC MEDICINE INSTITUTE. Lecturer, Post-Graduate Homoeopathy, to students of above institutions, Moderator and External Examiner M.Hom, D.Hom and Ph.D. External examiner peer reviews to the Chiropractors, Homoeopaths and Allied Health Professions Council for Registration purposes. Member of the Complementary Medicine Committee Broad Based Reference Group. 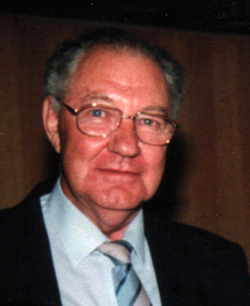 Dr. Prinsloo started his practice in 1956 making him, at the time of his death, one of the longest practising Homoeopathic practitioners in the Country and possibly in the world. His practice was built upon results and referrals with an international patient base and world-wide acclaim. He was consulted by patients from as far as the U.S.A., U.K., France, Netherlands, Belgium, Israel, Australia, Ghana, Kenia, Ethiopia and throughout South Africa. by Prof. Alfred Geldenhuys D.Ed. "Softly the leaves of memory fall, Slowly we'll gather and pick them all. Because today, tomorrow and till our lives are through, we'll always cherish having had a Husband, Father, Grandfather, Friend, Doctor and Colleague like you"
Later moved to Pretoria where he also met his Wife Maureen. He always considered the needs of others above his own. In the words of his beloved wife "no woman could ever ask for a better husband than him"
One of the things mentioned more than any other was that Hannes always had time for others, he always made time for others and he always had the answers. He had the greatest of respect for Prof. Munich with whom he always maintained contact and always spoke of as one of the greatest scientists South Africa ever produced. He subsequently completed his first course in Homoeopathy with the Anglo American College of Homoeopathy. He entered his second course of study when he joined the first group of students at Lindlar College from where he graduated towards the end of the 1950's. It was here that he met his next mentor and role model, the late Dr. Bill Lilley, who was a founder member and lecturer at Lindlar College. He always used to refer to Dr. Bill Lilley as one of the great Masters of Homoeopathy and often said that Dr. Bill Lilley was the last of the old Greats, a True Master of Homoeopathy. The person who had a most important and profound influence upon his professional career was the late Dr. Herman Kessel LMSSA, MRCP, MRCS, MD. Dr. Kessel was to him a friend, a mentor and a role model, he guided his career in so many aspects. Dr.Kessel was a person whom Hannes looked up to and so often spoke of with the greatest passion and respect. Dr. Prinsloo started his own very modest practice where he soon established himself and became known for his successes, especially in the most difficult of cases. In 1974 he was awarded a Ph.D., which was later followed by an Honorary Ph.D. These became his most cherished qualifications and achievements. He continued his studies in Homoeopathy and acquired a post graduate diploma in Practical and Applied Homoeopathy also with distinction in 1984. Besides his studies in Homoeopathy he also qualified as Naturopath and Osteopath, he completed Chiropractics for which he never registered locally feeling that Osteopathy was not only sufficient but more holistic. He studied Herbalism at the British Herbal Union, one of the most respected and recognised Herbal teaching institution at the time. He was a qualified Physiotherapist and was instrumental in allowing men to enter the Physiotherapy Profession in South Africa. His Professional distinctions and achievements are truly too numerous to mention. In 1996 he attended a Continuing Education Program instituted for newly registered practitioners by the Chiropractors, Homoeopaths Professions Council, again demonstrating his humbleness and his interest in Medical studies. The interest in his lectures was so great that he was then asked by his colleagues to continue his section of the lectures after the official course was completed. Due to sheer demand he continued offering his lectures at the University of Pretoria to the end of his life. He was often described by colleagues as "The Father of Homeopathy in South Africa", "The top Homoeopath in the World", "A walking Library". Messages in the days after his passing included words like "Medicine lost one of its greatest leaders and Physicians"
Everyone who ever knew him had the highest respect and regard for him, but more than that he had so much respect for them. His door was always open to them for any advice and help they might have needed. Practitioners used to call him while they had patients in-front of them asking for advice and he always made time to assist whether he was busy consulting or not. With more than 40,000 patients treated and a current patient base of more than 6,000 from all four corners of this country and abroad. He developed a brilliant computer program for the selection of Homoeopathic medicine. The program was developed over a 10 year period and is unique in every respect. One of the most highly read individuals one can imagine, he was never without a book, whether in the sitting room in front of the television, in his practice, where-ever he went he always had a book with him. One could never in such presentation sketch a picture or even begin to explain what Hannes was all about, his outlook on life, his exceptional wisdom, his astoundingly high intelligence and enquiring mind. "God needed a Healer in Heaven and chose one of His greatest sons for the task"